For other uses, see Jaffa (disambiguation). View of Jaffa from the Tel Aviv Promenade. View of Kikar Kedumim Street (Jaffa) and the bell tower of St. Peter's Church. Jaffa or Yafo (Hebrew: יפו‎‎, Yāfō ; Arabic: يَافَا‎‎, also called Japho or Joppa), is the southern and oldest part of Tel Aviv-Yafo, an ancient port city in Israel. 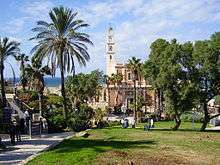 Jaffa is famous for its association with the biblical stories of Jonah, Solomon and Saint Peter as well as the mythological story of Andromeda and Perseus. The town was mentioned in Egyptian sources and the Amarna letters as Yapu. Mythology says that it is named for Japheth, one of the sons of Noah, the one who built it after the Great Flood. The Hellenist tradition links the name to Iopeia, or Cassiopeia, mother of Andromeda. An outcropping of rocks near the harbor is reputed to have been the place where Andromeda was rescued by Perseus. Pliny the Elder associated the name with Jopa, the daughter of Aeolus, the god of the wind. The Arab geographer Al-Muqaddasi referred to it as Yaffa. 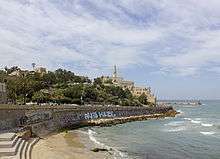 Tel Yafo (Jaffa Hill) rises to a height of 40 metres (130 feet) with a broad view of the coastline. Hence it had a strategic importance in military history. The accumulation of debris and landfill over the centuries made the hill even higher. Archaeological evidence shows that Jaffa was inhabited roughly 7,500 years BCE. The natural harbour of Jaffa has been in use since the Bronze Age. Jaffa is mentioned in an Ancient Egyptian letter from 1440 BCE, glorifying its conquest by Pharaoh Thutmose III, whose general, Djehuty hid armed Egyptian warriors in large baskets and sent the baskets as a present to the Canaanite city's governor. The city is also mentioned in the Amarna letters under its Egyptian name Ya-Pho, ( Ya-Pu, EA 296, l.33). The city was under Egyptian rule until around 800 BCE. Jaffa is mentioned four times in the Hebrew Bible, as a city opposite the territory given to the Hebrew Tribe of Dan (Book of Joshua 19:46), as port-of-entry for the cedars of Lebanon for Solomon's Temple (2 Chronicles 2:16), as the place whence the prophet Jonah embarked for Tarshish (Book of Jonah 1:3) and again as port-of-entry for the cedars of Lebanon for the Second Temple of Jerusalem (Book of Ezra 3:7). Jaffa is mentioned in the Book of Joshua as the territorial border of the Tribe of Dan, hence the modern term "Gush Dan" for the center of the coastal plain. The tribe of Dan did not manage to dislocate the Philistines from Jaffa, but many descendants of Dan lived along the coast and earned their living from shipmaking and sailing. In the "Song of Deborah" the prophetess asks: "דן למה יגור אוניות": "Why doth Dan dwell in ships?" After Canaanite and Philistine dominion, King David and his son King Solomon conquered Jaffa and used its port to bring the cedars used in the construction of the First Temple from Tyre. The city remained in Israelite hands even after the split of the united Kingdom of Israel. In 701 BCE, in the days of King Hezekiah (חזקיהו), Sennacherib, king of Assyria, invaded the region from Jaffa. After a period of Babylonian occupation, under Persian rule, Jaffa was governed by Phoenicians from Tyre. Alexander the Great's troops were stationed in Jaffa. It later became a Seleucid Hellenized port until it was taken over by the Maccabean rebels (1 Maccabees x.76, xiv.5) and the refounded Jewish kingdom. During the Roman repression of the Jewish Revolt, Jaffa was captured and burned by Cestius Gallus. The Roman Jewish historian Josephus (Jewish War 2.507–509, 3:414–426) writes that 8,400 inhabitants were massacred. Pirates operating from the rebuilt port incurred the wrath of Vespasian, who razed the city and erected a citadel in its place, installing a Roman garrison there. The New Testament account of Saint Peter bringing back to life the widow Tabitha (Greek: δορκας or Dorcas), recorded in Acts 9:36–42, takes place in Jaffa, then called in Greek Ἰόππη (Ioppe, Latinized as Joppa). Acts 10:10–23 relates that, while Peter was in Jaffa, he had a vision of a large sheet filled with "clean" and "unclean" animals being lowered from heaven, together with a message from the Holy Spirit telling him to accompany several messengers to Cornelius in Caesarea. Peter retells the story of his vision in Acts 11:4-17, explaining how he had come to preach the Christian gospel to the gentiles. In Midrash Tanna'im in its chapter Deuteronomy 33:19, reference is made to Rav Yosi (2nd century) travelling through Jaffa. Jaffa seems to have attracted serious Jewish scholars in the 4th and 5th century. The Jerusalem Talmud (compiled 4th and 5th century) in Moed Ketan references Rav Acha of Jaffa; and in Pesachim chapter 1 refers to Rav Phineas of Jaffa. The Babylonian Talmud (compiled 5th century) in Megillah 16b mentions Rav Adda Demin of Jaffa. Leviticus Rabbah (compiled between 5th and 7th century) mentions Rav Nachman of Jaffa. The Pesikta Rabbati (written in the 9th century) in chapter 17 mentions R. Tanchum of Jaffa. 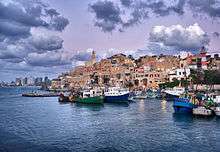 During the first centuries of Christianity, Jaffa was a fairly unimportant Roman and Byzantine locality, which only in the 5th century became a bishopric. A very small number of its Greek or Latin bishops are known. In 636 Jaffa was conquered by Arabs. Under Islamic rule, it served as a port of Ramla, then the provincial capital. Jaffa was captured in June 1099 during the First Crusade, and was the centre of the County of Jaffa and Ascalon, one of the vassals of the Kingdom of Jerusalem. One of its counts, John of Ibelin, wrote the principal book of the Assizes of the Kingdom of Jerusalem. During the period of the Crusades, the Jewish traveller Benjamin of Tudela (1170) sojourned at Jaffa, and found there just one Jew, a dyer by trade. Saladin conquered Jaffa in 1187. The city surrendered to King Richard the Lionheart on 10 September 1191, three days after the Battle of Arsuf. Despite efforts by Saladin to reoccupy the city in July 1192 (Battle of Jaffa) the city remained in the hands of the Crusaders. On 2 September 1192, the Treaty of Jaffa was formally signed, guaranteeing a three-year truce between the two armies. Frederick II fortified the castle of Jaffa and had two inscriptions carved into city wall, one Latin and the other Arabic. The inscription, deciphered in 2011, describes him as the "Holy Roman Emperor" and bears the date "1229 of the Incarnation of our Lord Jesus the Messiah." In 1268, Jaffa was conquered by Egyptian Mamluks, led by Baibars. In the 14th century, the city was completely destroyed for fear of new crusades. According to the traveller Cotwyk, Jaffa was a heap of ruins at the end of the 16th century. In 1515, Jaffa was conquered by the Ottoman sultan Selim I. The 17th century saw the beginning of the re-establishment of churches and hostels for Christian pilgrims en route to Jerusalem and the Galilee. During the 18th century, the coastline around Jaffa was often besieged by pirates and this led to the inhabitants relocating to Ramleh and Lydda where they relied on messages from a solitary guard house to inform them when ships were approaching the harbour. The landing of goods and passengers was notoriously difficult and dangerous. Until well into the 20th century, ships had to rely on teams of oarsmen to bring their cargo ashore. "On 10 March 1799 in the afternoon, the prisoners of Jaffa were marched off in the midst of a vast square phalanx formed by the troops of General Bon... The Turks, walking along in total disorder, had already guessed their fate and appeared not even to shed any tears... When they finally arrived in the sand dunes to the south-west of Jaffa, they were ordered to halt beside a pool of yellowish water. The officer commanding the troops then divided the mass of prisoners into small groups, who were led off to several different points and shot... Finally, of all the prisoners there only remained those who were beside the pool of water. Our soldiers had used up their cartridges, so there was nothing to be done but to dispatch them with bayonets and knives. ... The result ... was a terrible pyramid of dead and dying bodies dripping blood and the bodies of those already dead had to be pulled away so as to finish off those unfortunate beings who, concealed under this awful and terrible wall of bodies, had not yet been struck down." Many more died in an epidemic of bubonic plague that broke out soon afterwards. 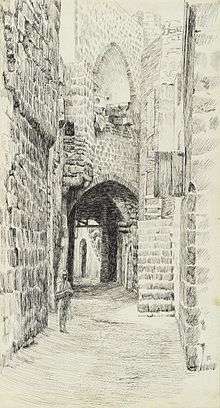 The governor who was appointed after these devastating events, Muhammad Abu-Nabbut, commenced wide-ranging building and restoration work in Jaffa, including the Mahmoudiya Mosque and Sabil Abu Nabbut. 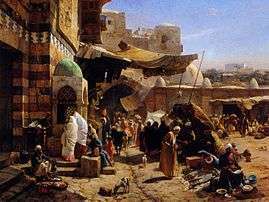 During the 1834 Arab revolt in Palestine, Jaffa was besieged for forty days by "mountaineers" in revolt against Ibrahim Pasha. Residential life in the city was reestablished in the early 19th century. In 1820 Isaiah Ajiman of Istanbul built a synagogue and hostel for the accommodation of Jews on their way to the holy cities of Jerusalem, Hebron, Tiberias and Safed. This area became known as Dar al-Yehud (Arabic for "the house of the Jews"); and was the basis of the Jewish community in Jaffa. The appointment of Mahmud Aja as Ottoman governor marked the beginning of a period of stability and growth for the city, interrupted by the 1832 conquest of the city by Muhammed Ali of Egypt. By 1839, at least 153 Sephardi Jews were living in Jaffa. 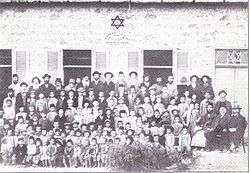 The community was served for fifty years by rabbi Yehuda HaLevi of Ragusa. In the early 1850s, HaLevi leased an orchard to Clorinda Minor, founder of a Christian Messianic community that established Mount Hope, a farming initiative to encourage local Jews to learn manual trades, which the Messianics did in order to pave wave for the Second Coming of Jesus. In 1855, the British Jewish philanthropist Moses Montefiore bought the orchard from HaLevi, although Minor continued to manage it. 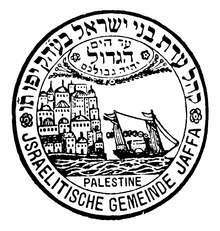 Seal of the Jewish community of Jaffa (1892), bearing the biblical phrase: "Unto the Great sea shall be your coast"
By the beginning of the 20th century, the population of Jaffa had swelled considerably. A group of Jews left Jaffa for the sand dunes to the north, where in 1909 they held a lottery to divide the lots acquired earlier. The settlement was known at first as Ahuzat Bayit (Hebrew: אחוזת בית), but an assembly of its residents changed its name to Tel Aviv on 21 May 1910. Other Jewish suburbs to Jaffa were founded at about the same time. In 1904, rabbi Abraham Isaac Kook (1864–1935) moved to Palestine and took up the position of chief rabbi of Jaffa. In 1917, the Ottoman authorities expelled the entire civilian population. While the Muslim evacuees were allowed to return before long, the Jewish evacuees remained in camps (and some in Egypt) until after the British conquest. During the course of their campaign through Palestine and the Sinai against the Ottomans, the British took Jaffa in November 1917 although it remained under observation and fire from the Ottomans. The battle of Jaffa in late December 1917 pushed back the Ottoman forces securing Jaffa and the line of communication between it and Jerusalem (which had been taken on 11 December). 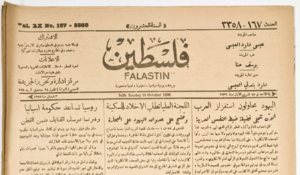 A 1936 issue of Falastin newspaper which was established by Palestinian Christians from Jaffa in 1911. During the British Mandate, tension between the Jewish and Arab population increased. A wave of Arab attacks during 1920 and 1921 caused many Jewish residents to flee and resettle in Tel Aviv, initially a desolate and marginal Jewish neighborhood north of Jaffa. The Jaffa riots in 1921, (known in Hebrew as Meoraot Tarpa) began with a May Day parade that turned violent. Arab rioters attacked Jewish residents and buildings killing 47 Jews and wounding 146 Jews. The Hebrew author Yosef Haim Brenner was killed in the riots. At the end of 1922, Jaffa had 47,799 residents and Tel Aviv, 15,000. By 1927, the population of Tel Aviv was up to 38,000. The 1936–39 Arab revolt in Palestine inflicted great economic and infrastructural damage on Jaffa. It began on 19 April 1936 with a riot remembered as The Bloody Day in Jaffa, which ended with 9 Jews killed and "scores" injured. The Arab leadership declared a general strike which began in the Jaffa Port, a place that which had already become a symbol of Arab resistance. 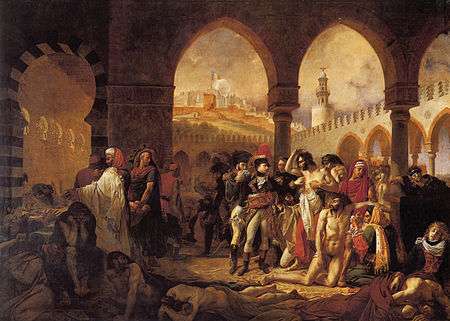 Military reinforcements were brought in from Malta and Egypt to subdue the rioting which spread throughout the country. 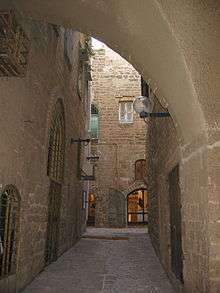 Jaffa's old city, with its maze of homes, winding alleyways and underground sewer system, provided an ideal escape route for the rioters fleeing the British army. In May, municipal services were cut off, the old city was barricaded, and access roads were covered with glass shards and nails. In June, British bombers dropped boxes of leaflets in Arabic requesting the inhabitants to evacuate that same day. On the evening of 17 June 1936, 1,500 British soldiers entered Jaffa and a British warship sealed off escape routes by sea. The British Royal Engineers blew up homes from east to west, leaving an open strip that cut through the heart of the city from end to end. On 29 June, security forces implemented another stage of the plan, carving a swath from north to south. The mandatory authorities claimed the operation was part of a "facelift" of the old city. In 1945, Jaffa had a population of 101,580, of whom 53,930 were Muslims, 30,820 were Jews and 16,800 were Christians. The Christians were mostly Greek Orthodox and about one sixth of them were Uniate. One of the most prominent members of the Arab Christian community was the Arab Orthodox Issa El-Issa, publisher of the newspaper Filastin. In 1947, the UN Special Commission on Palestine recommended that Jaffa be included in the planned Jewish state. Due to the large Arab majority, however, it was instead designated as part of the Arab state in the 1947 UN Partition Plan. Following the inter-communal violence which broke out following the passing of the UN partition resolution the mayors of Jaffa and Tel Aviv tried to calm their communities. One of the main concerns for the people of Jaffa was the protection of the citrus fruit export trade which had still not reached its pre-Second World War highs. Eventually the bilateral orange-picking and exporting of both sides continued although without a formal agreement. At the beginning of 1948 Jaffa's defenders consisted of one company of around 400 men organised by the Muslim Brotherhood. As in Haifa, the irregulars intimidated the local population. 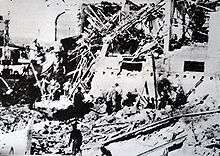 On 4 January 1948 the Lehi detonated a truck bomb outside the 3-storey 'Serrani', Jaffa's Ottoman built Town Hall, killing 26 and injuring hundreds. The driver was reported to be wearing the uniform of the Royal Irish Fusiliers. In February Jaffa's Mayor, Yussuf Haykal, contacted David Ben-Gurion through a British intermediary trying to secure a peace agreement with Tel Aviv. But the commander of the Arab militia in Jaffa opposed it. 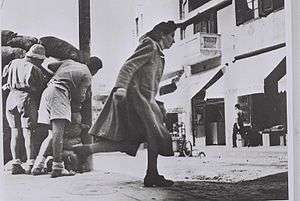 On 25 April 1948, Irgun launched an offensive on Jaffa. This began with a mortar bombardment which went on for three days during which twenty tons of high explosive were fired into the town. On 27 April the British Government, fearing a repetition of the mass exodus from Haifa the week before, ordered the British Army to confront the Irgun and their offensive ended. Simultaneously the Haganah had launched Operation Chametz which overran the villages East of Jaffa and cut the town off from the interior. The population of Jaffa on the eve of the attack was between 50,000 and 60,000, with some 20,000 people having already left the town. By 30 April, there were 15,000–25,000 remaining. In the following days a further 10,000–20,000 people fled by sea. When the Haganah took control of the town on 14 May around 4,000 people were left. The town and harbour's warehouses were extensively looted. The 3,800 Arabs who remained in Jaffa after the exodus were concentrated in the Ajami district and subject to strict martial law. The boundaries of Tel Aviv and Jaffa became a matter of contention between the Tel Aviv municipality and the Israeli government during 1948. The former wished to incorporate only the northern Jewish suburbs of Jaffa, while the latter wanted a more complete unification. 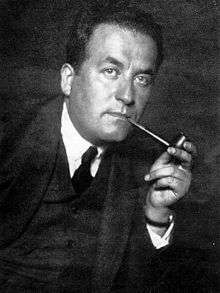 The issue also had international sensitivity, since the main part of Jaffa was in the Arab portion of the United Nations Partition Plan, whereas Tel Aviv was not, and no armistice agreements had yet been signed. On 10 December 1948, the government announced the annexation to Tel Aviv of Jaffa's Jewish suburbs, the Arab neighborhood of Abu Kabir, the Arab village of Salama and some of its agricultural land, and the working class Jewish area of Hatikva. On 25 February 1949, the depopulated Arab village of Sheikh Muanis was also annexed to Tel Aviv. On 18 May 1949, the Arab neighborhood of Manshiya and part of Jaffa's central zone were added, for the first time including land that had been in the Arab portion of the UN partition plan. The government decided on a permanent unification of Tel Aviv and Jaffa on 4 October 1949, but the actual unification was delayed until 24 April 1950 due to concerted opposition from Tel Aviv's mayor Israel Rokach. The name of the unified city was Tel Aviv until 19 August 1950, when it was renamed as Tel Aviv-Yafo in order to preserve the historical name Jaffa. From the 1990s onwards, efforts have been made to restore Arab and Islamic landmarks, such as the Mosque of the Sea and Hassan Bek Mosque, and document the history of Jaffa's Arab population. Parts of the Old City have been renovated, turning Jaffa into a tourist attraction featuring old restored buildings, art galleries, theaters, souvenir shops, restaurants, sidewalk cafes and promenades. 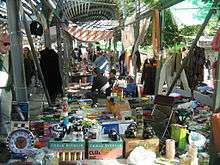 Many artists have moved their studios from Tel Aviv to the Old City and its surroundings, such as the Jaffa port, the American–Germany Colony and the flea market. Beyond the Old City and tourist sites, many neighborhoods of Jaffa are poor and underdeveloped. However, real-estate prices have risen sharply due to gentrification projects in al-Ajami and Lev Yafo. 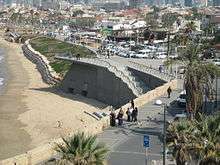 The municipality of Tel Aviv-Jaffa is currently working to beautify and modernize the port area. In the 19th century, Jaffa was best known for its soap industry. Modern industry emerged in the late 1880s. The most successful enterprises were metalworking factories, among them the machine shop run by the Templers that employed over 100 workers in 1910. Other factories produced orange-crates, barrels, corks, noodles, ice, seltzer, candy, soap, olive oil, leather, alkali, wine, cosmetics and ink. Most of the newspapers and books printed in Palestine were published in Jaffa. Until the mid-19th century, Jaffa's orange groves were mainly owned by Arabs, who employed traditional methods of farming. The pioneers of modern agriculture in Jaffa were American settlers, who brought in farm machinery in the 1850s and 1860s, followed by the Templers and the Jews. From the 1880s, real estate became an important branch of the economy. A 'biarah' (a watered garden) cost 100,000 piastres and annually produced 15,000, of which the farming costs were 5,000: 'A very fair percentage return on the investment.' Water for the gardens was easily accessible with wells between ten and forty feet deep. Jaffa's citrus industry began to flourish in the last quarter of the 19th century. E.C. Miller records that 'about ten million' oranges were being exported annually, and that the town was surrounded by 'three or four hundred orange gardens, each containing upwards of one thousand trees'. Shamuti oranges were the major crop, but citrons, lemons and mandarin oranges were also grown. Jaffa had a reputation for producing the best pomegranates. 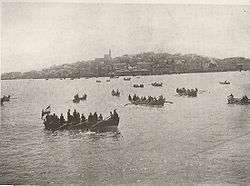 According to a census conducted in 1922 by the British Mandate authorities, Jaffa had a population of 47,799, consisting of 20,699 Muslims, 20,152 Jews and 6850 Christians., increasing to 51,866 in the 1931 census, residing in 11,304 houses. Modern Jaffa has a heterogeneous population of Jews, Christians, and Muslims. Jaffa currently has 46,000 residents, of whom 30,000 are Jews and 16,000 are Arabs. The 2010 film Port of Memory explores these themes. Tabeetha School in Jaffa was founded in 1863. It is owned by the Church of Scotland. The school provides education in English to children from Christian, Jewish and Muslim backgrounds. Jaffa suffers from drug problems, high crime rates and violence. Some Arab residents have alleged that the Israeli authorities are attempting to Judaize Jaffa by evicting Arab residents from houses owned by the Amidar government-operated public housing company. Amidar representatives say the residents are illegal squatters. The 2010 film Port of Memory explores these themes. The Clock Square with its distinctive clocktower was built in 1906 in honor of Sultan Abdul Hamid II. The Saraya (governor's palace) was built in the 1890s. Andromeda rock is the rock to which beautiful Andromeda was chained in Greek mythology. The Zodiac alleys are a maze of restored alleys leading to the harbor. Jaffa Hill is a center for archaeological finds, including restored Egyptian gates, about 3,500 years old. 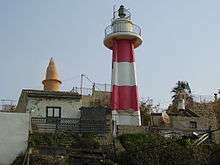 Jaffa Lighthouse is an inactive lighthouse located in the old port. The Jaffa Museum of Antiquities is located in an 18th-century Ottoman building constructed on the remains of a Crusader fortress. In 1811, Abu Nabout turned it into his seat of government. In the late 19th century, the governmental moved to the "New Saraya," and the building was sold to a wealthy Greek-Orthodox family who established a soap factory there. Since 1961, it has housed an archaeological museum, which is currently closed to the general public. 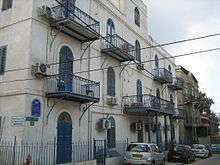 The Libyan Synagogue (Beit Zunana) was a synagogue built by a Jewish landlord, Zunana, in the 18th century. It was turned into a hotel and then a soap factory, and reopened as a synagogue for Libyan Jewish immigrants after 1948. In 1995, it became a museum. Other museums and galleries in the area include the Farkash Gallery collection. The Greek Orthodox Monastery of Archangel Michael (Patriarchate of Jerusalem) near Jaffa Port also has Romanian and Russian communities in its compound. Built in 1894, the Church of St. Peter and St. Tabitha serves the Russian Orthodox Christian community, with services in Russian and Hebrew; underneath the chapel nearby there is what is believed to be the tomb of St Tabitha. St. Peter's Church is a Franciscan Roman-Catholic basilica and hospice built in 1654 on the remains of a Crusaders fortress, and commemorates St Peter, as he brought the disciple Tabitha back from the dead; Napoleon is believed to have stayed there. Immanuel Church, built 1904, serves today a Lutheran congregation with services in English and Hebrew. The Saint Nicholas Armenian Monastery was built in the 17th century. Al-Bahr Mosque, lit. the Sea Mosque, overlooking the harbour, is depicted in a painting from 1675 by the Dutch painter Lebrun. 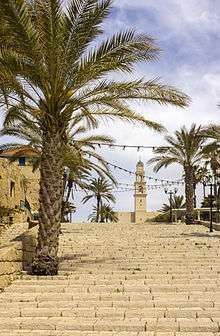 It may be Jaffa's oldest existing mosque, although the original date of construction is unknown and changes to the structure have been made since then, such as the addition of a second floor and reconstruction of the upper part of the minaret. It was used by fishermen and sailors frequenting the port, and residents of the surrounding area. According to local legend, the wives of sailors living in Jaffa prayed there for the safe return of their husbands. The mosque was renovated in 1997. Mahmoudia Mosque was built in 1812 by Abu Nabbut, governor of Jaffa from 1810 to 1820. Outside the mosque is a water fountain (sabil) for pilgrims. Nouzha Mosque on Jerusalem Boulevard is Jaffa's main mosque today. The majority of excavations in Jaffa are salvage in nature and are conducted by the Israel Antiquities Authority since the 1990s. Excavations on Rabbi Pinchas Street, for example, in the flea market have revealed walls and water conduits dating to the Iron Age, Hellenistic period, early Islamic period, Crusader period and Ottoman era. A limestone slab (50 cm × 50 cm or 20 in × 20 in) engraved with a menorah discovered on Tanchum Street is believed to be the door of a tomb. Additional efforts to conduct research excavations at that site included those of B. J. Isserlin (1950), Ze'ev Herzog of Tel Aviv University (1997-1999), and most recently the Jaffa Cultural Heritage Project (since 2007), directed by Aaron A. Burke (UCLA) and Martin Peilstocker (Johannes-Gutenberg University). Collège des Frères de Jaffa, a French international school, is in Jaffa. Jaffa is served by the Dan Bus Company, which operates buses to various neighborhoods of Tel Aviv and Bat Yam. The Red Line of the planned Tel Aviv Light Rail will cross Jaffa north to south along Jerusalem Boulevard. Jaffa Railway Station was the first railway station in the Middle East. It served as the terminus for the Jaffa–Jerusalem railway. The station opened in 1891 and closed in 1948. 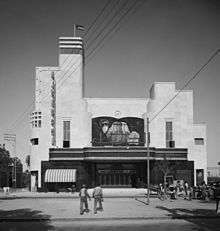 In 2005–09, the station was restored and converted into an entertainment and leisure venue marketed as "HaTachana", Hebrew for "the station" (see homepage here:). Clash of the Titans is set in ancient Joppa. The 2009 Oscar-nominated film Ajami is set in modern Jaffa. ↑ One example of this legend is the sixteenth-century French pilgrim Denis Possot who recorded, "Jaffe, est le port de la Terre saincte, anciennement nommé Joppe, faict et construict premierment en ville et cité grande à merveilles et de grant renom, par Japhet, fils de Noé." in his Le Voyage de la Terre Sainte (Geneva: Slatkine Reprints 1971, reprint of Paris edition, 1890, orig. 1532), p. 155. Likewise another pilgrim, Sir Richard of Guylforde wrote,"This Jaffe was sometyme a grete Cytie [...] and it was one of the firste Cyties of the worlde founded by Japheth, Noes sone, and beryth yet his name." in the pilgrimage narrative from 1506, recorded by his chaplain in 1511, edited by by Sir Henry Ellis (London: Camden Society, 1851), p. 16. ↑ "TEL YAFO EXPEDITION: Excavations at Ancient Jaffa (Joppa)". Tel Aviv University. ↑ "Judges Chapter 5 שׁוֹפְטִים". Judges 5:17 – Gilead abode beyond the Jordan; and Dan, why doth he sojourn by the ships? Asher dwelt at the shore of the sea, and abideth by its bays. ↑ Le Quien, Oriens Christianus, III, 627. ↑ Le Quien, Oriens Christianus, III, 625–30, 1291; Eubel, Hierarchia catholica medii aevi, Munich, I, 297; II, 186. ↑ W. M. Thomson, The Land and the Book, c. 1860, page 515. 1 2 Jacques-François Moit (1814). Mémoires pour servir à l'histoire des expéditions en Égypte et en Syrie. , quoted in Véronique Nahoum-Grappe (2002). "The anthropology of extreme violence: the crime of desecration". International Social Science Journal. 54 (174): 549–557. doi:10.1111/1468-2451.00409. ↑ Friedman, Lior (5 April 2009). "The mountain of despair,". Haaretz.com. Retrieved 25 August 2013. ↑ Thompson (above) writing in 1856 has '25 years ago the inhabitants of the city and gardens were about 6000; now there must be 15,000 at least...' Considering the length of time he lived in the area this may be a more accurate count. ↑ Rav Hillel Rachmani. "Rabbi Abraham Isaac Kook". Jewish Virtual Library. ↑ Friedman, Isaiah (1971). "German Intervention on Behalf of the "Yishuv"", 1917 , Jewish Social Studies, Vol. 33, pp. 23–43. ↑ Report of the Commission of Inquiry into the disturbances in Palestine in May, 1921, with correspondence relating thereto (Disturbances), 1921, Cmd. 1540, p. 60. ↑ Honig, Sarah (30 April 2009). "Another Tack: The May Day Massacre of 1921". ↑ Viton, Albert (3 June 1936). "Why Arabs Kill Jews". The Nation. Retrieved 24 August 2016. ↑ A/RES/181(II)(A+B), Resolution 181 (II). Future government of Palestine (UN Partition Plan details), United Nations General Assembly, 29 November 1947, The area of the Arab enclave of Jaffa consists of that part of the town-planning area of Jaffa which lies to the west of the Jewish quarters lying south of Tel-Aviv, to the west of the continuation of Herzl street up to its junction with the Jaffa-Jerusalem road, to the south-west of the section of the Jaffa-Jerusalem road lying south-east of that junction, to the west of Miqve Israel lands, to the north-west of Holon local council area, to the north of the line linking up the north-west corner of Holon with the north-east corner of Bat Yam local council area and to the north of Bat Yam local council area. The question of Karton quarter will be decided by the Boundary Commission, bearing in mind among other considerations the desirability of including the smallest possible number of its Arab inhabitants and the largest possible number of its Jewish inhabitants in the Jewish State. ↑ Dov Joseph, 'The Faithful City', Simon and Schuster, 1960. Library of Congress number: 60-10976. Page 24: 'In an exchange of letters between Mayor Yisrael Rokach of Tel Aviv and Mayor Youssef Haikal of Jaffa, both agreed to call upon the residents to maintain peace and quite'. 1 2 3 Benny Morris (2004). The Birth of the Palestinian Refugee Problem Revisited. Cambridge University Press. pp. 115–. ISBN 978-0-521-00967-6. (p. 114) And rifts among the Jaffa Arabs from the beginning subverted all efforts at peacemaking. In February, Ben-Gurion wrote to Shertok that Heikal, through a British intermediary,was trying to secure an agreement with Tel Aviv but that the new irregulars’ commander, ‘Abdul Wahab ‘Ali Shihaini, had blocked him. .... According to Ben-Gurion, Shihaini had answered: ‘I do not mind [the] destruction [of] Jaffa if we secure [the] destruction [of] Tel Aviv. As in Haifa, the irregulars intimidated the local population, echoing the experience of 1936–1939. ‘. . . The inhabitants were more afraid of their defenders-saviours than of the Jews their enemies’, wrote Nimr al Khatib. (p. 115) But Arab notables, through British intermediaries, continued to press for a wider citrus agreement. ... In the end, a formal agreement was never concluded. But neither was a complete blockade imposed on Jaffa, and the bilateral orange-picking and -exporting continued largely unhampered. ↑ LeBor, Adam (21 January 2006). "Jaffa: Divided it fell". The Independent. ↑ Morris, page 46. Attributes attack to 'LHI' (Lehi), doesn't number and gives date as 4 January. ↑ Benny Morris, 'The birth of the Palestinian refugee problem, 1947–1949', Cambridge University Press, 1987, ISBN 0-521-33028-9. Page 47. 1 2 Morris, page 95. ↑ Menachem Begin, 'The Revolt — story of the Irgun'. Translated by Samuel Katz. Hadar Publishing, Tel Aviv. 1964. pp. 355–371. 1 2 Morris, page 100. ↑ Karpel, Dalia (14 February 2008). "Wellsprings of memory". Haaretz – Israel News. Archived from the original on 25 March 2009. ↑ Ravit Goldhaber & Izhak Schnell; Schnell (2007). "A Model of Multidimensional Segregation in the Arab Ghetto in Tel Aviv-Jaffa". Tijdschrift voor Economische en Sociale Geografie. 98 (5): 603–620. doi:10.1111/j.1467-9663.2007.00428.x. 1 2 3 4 5 6 7 8 Arnon Golan (1995), The demarcation of Tel Aviv-Jaffa's municipal boundaries, Planning Perspectives, vol. 10, pp. 383–398. ↑ For example, Jonathan Kis-Lev's studio; see "A visit to the American Colony in Jaffa". Israel Traveler. 22 May 2011. ↑ Ashley (20 September 2012), Jaffa Flea Market: a Place to Sharpen Those Haggling Skills!, The Jaffa Flea Market [...] invites a younger, hipper crowd to inspect its newly added art galleries"
1 2 3 Jaffa: A City in Evolution Ruth Kark, Yad Yitzhak Ben-Zvi, Jerusalem, 1990, pp. 256–257. ↑ Dr Frankl, translated by P. Beaton, 'The Jews in the East'. Volume 1. Hurst and Blackett, London, 1859. Page 345. He adds 'The community is poor, and receives no alms from any quarter.' which resulted in some envy of the 'our bethren' in Jerusalem. ↑ Miller, page 97: 'The orange gardens are the finest in the East; and during the late winter and early spring, little white sailed vessels from Greece, Constantinople and the islands of the Archipelago, lie in calm weather at a short distance from the coast, waiting to carry away the fruit'. ↑ "History of Tabeetha". Tabeetha School in Jaffa. Retrieved 18 December 2012. ↑ Hai, Yigal (28 April 2007). "Protesters rally in Jaffa against move to evict local Arab families". Haaretz. ↑ "Tel aviv yafo". Tel-Aviv/Yafo Municipality. ↑ Pliny the Elder. "v.69". Natural History. ↑ "Old Jaffa Museum". Archived from the original on 2008-12-26. ↑ "Project Partners". The Jaffa Cultural Heritage Project. The Jaffa Museum of Archaeology. Retrieved 18 December 2012. ↑ "В день памяти праведной Тавифы на подворье Русской духовной миссии в Яффо совершена праздничная Литургия" [On the feast day of Tabitha of righteous memory, a festive liturgy performed in the courtyard of the Russian Ecclesiastical Mission in Jaffa]. Russian Orthodox Church. 9 November 2009. ↑ "Al-Bahr mosque in Jaffa". ArchNet Digital Library. ↑ "Sabil Abu Nabbut". ArchNet Digital Library. ↑ "Archaeology News in Israel". Biblical Productions. 2008. Retrieved 18 December 2012. Levine, Mark (2005). Overthrowing Geography, Jaffa, Tel Aviv, and the Struggle for Palestine, 1880–1948. Berkeley: University of California Press. ISBN 0-520-23994-6. Yahav, Dan (2004). Yafo, kalat ha-yam : me-ʻir roshah li-shekhunot ʻoni, degem le-i-shiṿyon merḥavi (in Hebrew). Tel Aviv: Tamouz. OCLC 59707598. Chelouche, Yosef Eliyahu (2005). Arashat Hayai: 1870–1930 (English: Reminiscences of My Life: 1870–1930) (in Hebrew). Tel Aviv: Babel. ISBN 965-512-096-1. OCLC 62317894. Šārôn Rôṭbard, Šārôn (2005). ʻÎr levānā, ʻîr šeḥôrā (English: White City, Black City) (in Hebrew). Tel Aviv: Babel. ISBN 978-965-512-096-7. OCLC 260080254. Lebor, Adam (2007). City of Oranges. Arabs and Jews in Jaffa. New York: W.W. Norton & Co. ISBN 0-7475-8602-0. Morris, Benny (1987). The Birth of the Palestinian Refugee Problem, 1947–1949. Cambridge: Cambridge University Press. ISBN 0-521-33028-9. "Jaffa — Bride of the Sea" or "Yaffo — Kalat Hayam" 2000, By Israeli artist Natali Lipin (views of the city Old Jaffa). Language — Hebrew/English. Segev, Tom (1998). 1949, the First Israelis. New York: Henry Holt. ISBN 0-8050-5896-6. Weill-Rochant, Catherine (2008). L'atlas de Tel Aviv : 1908–2008 (in French). Paris: CNRS Éditions. ISBN 2-271-06658-1. Yavin, Shmuel (2006). Bauhaus in Jaffa: Modern Architecture in an Ancient City. Tel Aviv: Bauhaus Center. ISBN 965-90606-2-9. "Yafa", Palestine and Syria, Leipsig: Karl Baedeker, 1876 . 1898 ed. ; 1912 ed. Wikimedia Commons has media related to Jaffa. Wikivoyage has a travel guide for Jaffa. Neff, Donald (April–May 1994). "Arab Jaffa seized before Israel's creation in 1948". Washington Report on Middle East Affairs: 75. "JAFFA (Hebr. Yafo; A. V. Joppa; Greek, Joppe; Arabic, Yaffa)". Jewish Encyclopedia. 1906. Schaalje, Jacqueline (May 2001). "Jaffa". The Jewish Magazine. "Jaffa". World Cities Images. Archived from the original on 2009-01-08. "Jaffa Old Harbour (photo gallery)". tel aviv 4 fun.